Not long after the death of Senator Kerr, a nonprofit charitable foundation, the Kerr Foundation, was established by his widow Grayce B. Kerr and their four children, Robert Jr., William, Breene, and Kay. 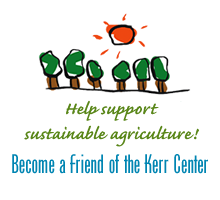 In 1965-66, after Mrs. Kerr died, the Kerr Foundation’s Agriculture Division was established to carry on Senator Kerr’s work in conservation-oriented agriculture. The staff specialists provided farmers and ranchers in the area with free technical assistance and information on how to improve their operations. Wise stewardship was emphasized. The “ag division” was headquartered on Senator Kerr’s ranch, and its focus was largely on cattle. The organization led a hard fought local (later national) educational campaign against brucellosis, a serious cattle disease. Before long, the foundation gained a reputation as a source of honest, reliable, science-based information. (Oklahoma was certified brucellosis free in 2001 and Kerr Center was honored for its part in this victory).